What services are included with your Full Services bundle? With our Full Services package we provision the CPE, handle primary and secondary DNS for you, host your subscriber’s email accounts, and provide 24 x 7 technical support for your customers. That includes handling DMCA notifications for claimed copyright infringement, and following up on spam and virus complaints. You’ll also get up to five hours of engineering assistance per month, and we’ll monitor your network 24 x 7. Finally, you will have access to TruVizion, our patented, web-based application that provides comprehensive diagnostics for DOCSIS networks, and compatible GPON and DSL networks. 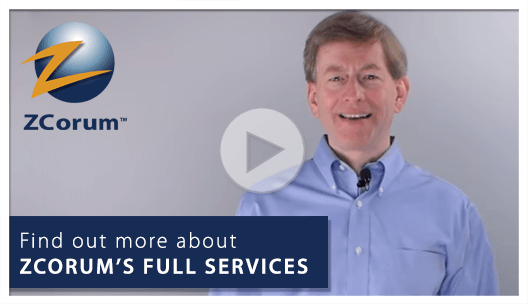 How does ZCorum differ from other full service providers? ZCorum was the first to help operators provide internet service when the internet was just getting started. Operators wanted a way to provide service for their video subscribers and we helped them do it affordably. ZCorum was one of the first ISP’s in the country. And we’ve never acquired a customer from a merger or acquisition. All of our customers are with us because they chose us over the competition. What if I’m already with another provider? In an ideal world, you would never have to worry about switching – your network would remain happily humming along with your current managed service provider, the software you pay for would be constantly updated with new features and you would actually like the people you’re partnering with. Unfortunately, the world is not ideal and you’re really longing to switch to another managed service provider. The anxiety begins when you think about switching to the new guys and if there will be down time. Perhaps it was a past move that didn’t go well or maybe it’s just resistance to the unknown, but it’s the job of ZCorum to make transitions painless and successful. We will work with you and your current or former provider if needed, to ensure your transition to ZCorum services is painless and straightforward. How do I change my subscribers over? Switching your managed services over to ZCorum requires completing a series of actions in a specific order to ensure that everything transfers over properly. ZCorum is with you every step of the way. Though it is a process, it is completely attainable within your needed time frame. Once we receive all the necessary data from you, usually a 30 to 45 day process, the implementation takes place overnight during a maintenance window. This process is approximately 12 hours with no down time and no outages on your network. Our project approach is key to the successful completion of every project. We strive to implement projects in a “phased-in approach”. The project is split up into individual phases, each with its own tasks and deliverables. Each phase provides functionality for the customer. The first step in the process is to take all the project’s requirements and strictly prioritize them. This information, in turn, will be used to plan out the distinct phases of the project. Regardless of the size of the project, several steps are necessary to ensure the solution is developed in the most effective, efficient and economical way. Here’s a brief outline of the steps taken in each project. Breakdown of the project into simple elements. Detailed planning of each element of the project plan. Define timelines and resources required. We can typically have service installed within 30 to 45 days of contract signing. Once we’ve received all necessary data from you it takes about 12 to 24 hours to complete the installation and have you up and running. What about my subscribers' e‐mail accounts? ZCorum includes up to five email accounts per user with our full-service offering. Subscribers can access their email via our webmail application, or through an email client such as Outlook Express or Thunderbird. Do you have packages available with different options? The Full Service Solution is for operators that require the benefits of a fully managed services operation. This gives operators time to focus on their core competencies like new video and voice services, plant maintenance, and marketing and sales activities. And yes most of our services, from diagnostics to end-user support, are available a la carte. So no matter what your goals are, our team will work with you to put together a package of managed services that will help your company operate profitably. Like or follow us for free industry resources and for the newest updates on ZCorum’s services.